Phantasmagoria in 1995. Photo from Adventures Under the Porcupine Tree. 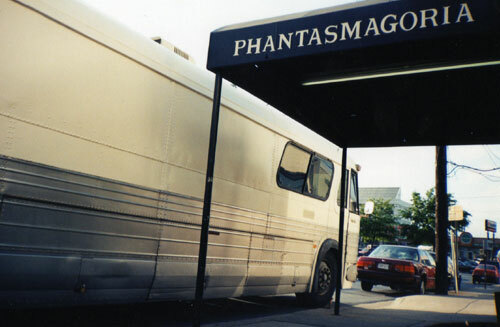 In 1996, Phantasmagoria moved to Elkin Street, next to one of my other favorite Wheaton venues, Legends Pool Hall. "Phantaz", as we called it, added a grill and a stage at their new venue, and all of the sudden Elkin Street boasted two hip venues. The tight streets and nighttime activity created a sort of feral urbanism, an area to walk around and feel natural despite the fact that I was trying to distract myself from the continuing decay of community and the arts in suburbia. Both Phantaz and Legends were places shady enough to be considered cool, but safe enough that my mother would reluctantly approve of me spending Friday nights shooting billiards and going to punk shows. Both were independent businesses, and both were affordable enough for crews of lower-middle class outcasts to seek refuge. In Legends, you were most likely to see Central American or Southeast Asian immigrants on the billiards tables or service industry types at the bar; meanwhile, Phantasmagoria attracted every kind of punk, indie rocker, metalhead, ska fan, or geek rocker you can imagine. I never got into any trouble there, save for coming home smelling like cigarettes (which I don't smoke now, and certainly wasn't then). Nonetheless, I felt welcome and at home in the shadows and back alleys of Wheaton, not in Wheaton Plaza or fast food joints where my more clean-cut classmates might be found bubbling around after school. Phantasmagoria closed in 2001 and was subsequently replaced by the Gilchrist Center for Cultural Diversity, which "provides activities and services to the County's diverse community and functions as a central point of contact for residents to County and other community services." I was 13 at the time, a little too young to have been able to go to Phantasmagoria, though I remember seeing it when I was younger and being freaked out by the people who hung around outside. I wish I'd had a chance to hang out there. A local music scene is one of the things that make our community great. Phantasmagoria may be gone, but I hope other venues like it will emerge to take its place. I hope so too! I miss Phantasmagoria. They also occasionally had jazz and reggae groups in there. It was a fun place to play music and also to go hear it. I was a grad student at AU from 1996 to 1998. I remember seeing some great metal shows at Phantasmagoria, meeting some cool people there. Above all, the bartender was really cute. I think she later sang in some "goth" band.